Murfreesboro with Larry Crowley, Banks Nelson, and Allen Haynes. We’ll have CD’s for sale, great beers, and some of my favorite songwriters on stage throughout the evening. If you like the album, I’m telling you- you want to see a live show! There is something unique and wondrous about being in the room with live performers, sharing the moments of make-or-break and the fun of leaving the world behind for a few hours. So check out that review, tell all your friends about the show on the 16th, and we’ll see you at 3 Brothers in Murfreesboro! I’ve been rehearsing for my first show since my album was finished. Not an official CD release, but a show all the same. 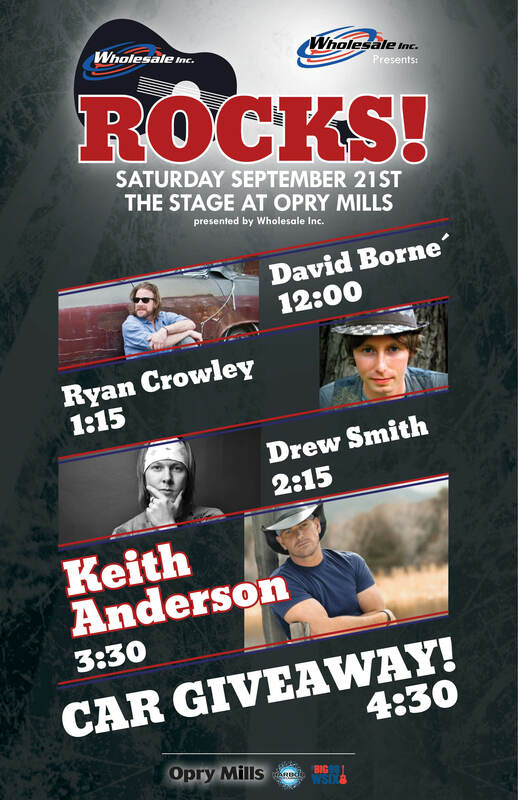 I’m playing at Opry Mills Mall on Saturday, September 21st at 1:15 with Neil Tufano on percussion, Kenny Zarider on Keys, and Keith Kenyon on bass. The event is brought to us by The Big 98 WSIX, Wholesale Inc, and Harbor Entertainment. I’ve never had a show brought to us by… anyone! It’s hard to believe that I’m sitting in the spot that I am. In so many ways, it was like I’d never arrive here. In other ways, I can’t believe it took me this long. Even still, I can’t stay here forever. I always joke about how I’m a dreamer, an idea guy. It’s really just an excuse for my snail-pace towards my goals. If I had a dollar for every time I took one step forward and one step back, I would be able to buy success instead of earn it. I seem to move laterally, merely looking forward while I do. It’s a perpetual crab walk that only time itself overcomes. But maybe I’m a hermit crab, just looking for a better shell to call home. Either way, we’re entering phase three of my solo career- promoting the album with live shows, interviews, and media appearances. As Saturday approaches, I’m sure that I’ve never been more ready to take the stage. Yesterday was my twenty-sixth birthday. While it was the first time I’ve turned 26, I seemed to manage it alright without any prior experience. I slept in for the first time in a long time, and spent the rest of my day with family. I’m now as old as my father was when I was born, making me half his age. I’m twice the age that I was when I moved to Tennessee, meaning I’ve spent half my life here. And when I started recording my album, I was twenty-four. Two-thousand Twelve was a year filled with distractions. Having a full time job and recording a solo project seemed like no big deal until I tried to do it. Days turned into weeks, and weeks turned into months as I tried to balance two separate lives, be two separate people. Words like perseverance and stamina could have easily been overtaken by despair and self-loathing. So strange, the path a journey takes. So often when I’m writing a song, it isn’t until I have it finished that I can look at it and understand myself, understand how I feel. It’s very therapeutic and revealing. I had no idea that making this album would do the same thing, on such a grander scale. Thirteen songs of revelations, thirteen songs of self-discovery. And here I am. 26 years in the making, with no regrets of the past, knowing that the better is very close, and the best is yet to come. I’m in the middle of a stretch at work that has me there for two weeks without a day off. I’m quite grateful for the overtime, actually, and while I wish I were sitting on my bed and playing my guitar, there is still a lot that I can do for the album even now. I’ve been listening to as much music as I possibly can for days. Lyle Lovett, Franky Perez, John Mayer. Anything I can get my hands on (ears on?). I’m listening to the scratchy way Lyle approaches the vocals on I Will Rise Up, and the way the telecasters chunk on Franky’s Cecilia. With these sounds in my ears, I’m seventeen again, a kid in a musical candy store soaking in the sweets of the song. It’s reasons like this why I love music. Even when I can’t get my hands around the guitar, I’m growing. Any one who is great at something got to be that way by treating their craft as a lifestyle and not as something to be checked off. It’s like working out only on the days you are going to be at the beach – you’re not going to get the results you want. And, while I feel myself slipping when I can’t just spend the whole day playing, hearing these songs throughout the day is like sitting in a lecture hall with a great professor. All I have to do is listen, and I learn. I suppose what I’m trying to get at is the idea of making the most of a situation. We all have dreams, we would all rather be doing more of one thing and less of another. Fortunately, the world isn’t always black and white. It isn’t all or nothing. I’m just trying to appreciate the time that I do have, and take advantage of it. If I can live these dreams a little bit everyday, I’ll have done a whole lot of dreaming by the end. I am like a tree who has grown tall, but I am not the earth. I’ve been experimenting with reverb and compression on a Cello track tonight. As if I could make an instrument that is so beautiful into something even better. No, what I’m really trying to do is to fit it inside a small box with a lot of other instruments. I’m trying to make an orchestra fit in my car, fit in someone’s iPod. My coffee keeps getting cold, and I keep putting it in the microwave. I’m not ready to finish it. I just want to sip on it a little while longer. So many things are in front of me, and I’m trying to control them all. Sometimes, it’s best to know when to let something happen, and stop trying to make it. We’re so close. So close. But this album won’t finish itself. There is work to do, and my supporters from Rockethub are awaiting the things that I have promised them. Oh, if only they could be in this room and hear what I hear coming out of these two speakers. I remember seeing in a documentary about Sgt. Pepper that the press had begun to think that The Beatles were done, it had been too long since an album had been released, that one wasn’t ever going to come. Paul said just you wait, just you wait and see what we have in store for you! Of course, I am not Paul McCartney. I have no expectation of my album changing the world. One thing I do know, however, is that I’m in the middle of the greatest thing I have ever done as a musician, and for that I am so very excited. So grateful. So humbled. Thank you God for giving me this opportunity. Thank you Rockethub supporters, thank you fellow musicians. You have given me a great gift with this project, and I can’t wait to share it with you in just a few short months! I reached the plateau and felt a gentle, momentary peace. Then, with the deepest of breaths, I looked up to survey the climb that was to come. Yesterday was a good day. I went in to work, like any other day, and stood at the service counter of the Nashville Mac Authority. In the dead spells, when all of my work is caught up and no customers are waiting in line, I have time to check my email and wander the wonderous world wide web. In the morning, I got my first bit of good news. My Rockethub project, the way we’ve found to finance my first solo album, had notified me that my account had been fueled. I checked the link, and my good friend Jordan Bennett and his wife Jessica had put in some money for me. They weren’t the only ones, either! Deanie Mullins, a woman I met in Arkansas on a gig with country artist Royal Wade Kimes, had also made a contribution. At this point in the day, I was getting quite excited! We are so close, we’re going to make our goal! Quickly, another thought came into my head. Joel and I are notorious for our phone tagging skills (cause that’s how we roll, dawg), and having been at his wedding a mere month ago, it seemed odd that he’d be calling me now. Following my suspicions, I checked on the status of my Rockethub campaign. Standing there, at the service counter at work, I put my hands on my head and allowed myself to be overwhelmed. So many feelings ran through my tiny brain…. relief, excitement, gratitude, hunger… well, maybe the hunger was still in my stomach, that’s up for debate among top men. Top Men. After a few phone calls, text messages, and chicken sandwiches, I began to think about how when one chapter ends, another begins. The fundraising campaign may have come to a close, but its purpose was to charge me with adventure. Now begins the real work, the work of making an album. The work of defining myself as a new artist. I feel like I’ve been waiting for this my whole life, I feel ready. The kicker is, because of this successful Rockethub Campaign, because of the generosity of my friends and family and the grace of God, I know that I have the strength and support to do it. Stay tuned for updates as the album unfolds! Our first official day of tracking is November 19th. Hey everyone! I promise I will post a real and complete blog soon. In the meantime, check out the article on Valience Music that was in the Murfreesboro Pulse!